I, as part of a team with Dr. Shaowen Bardzell and Dr. Jeffrey Bardzell, created this design as part of the Intel Science and Technology Center (ISTC) for Social Computing with the goal of encouraging discussions surrounding the ideas of self-tracking, body image, and surveillance. Specifically, this design focuses on how consumption of calories can result in weight gain. 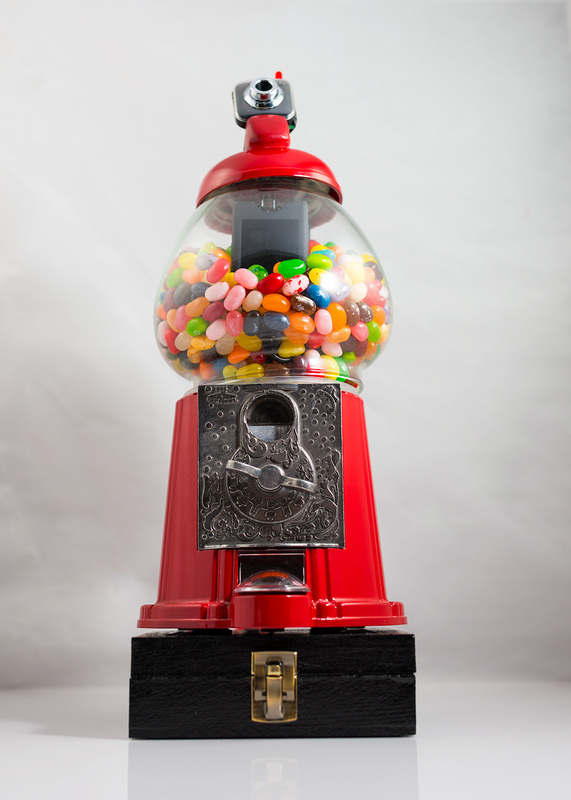 The Candy Camera is a candy machine that has been augmented to take pictures when candy is dispensed. The design’s form is based off of a Carousel gumball machine, reminiscent of the kinds of coin-operated candy machines common in mid twentieth century America. 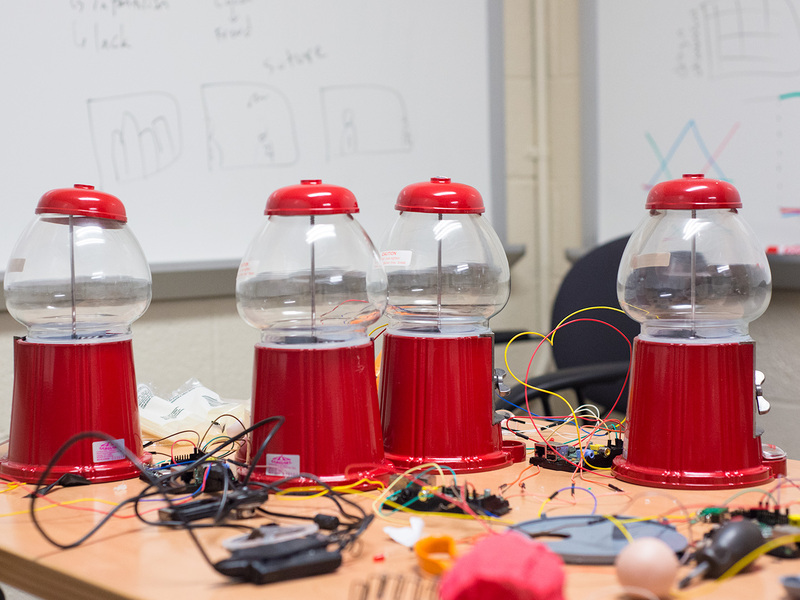 Rather than creating a device that disappears into the user’s life, this device is intended to stand out, and also change the tracking process from simply monitoring to attempting to actually change the process of eating candy. 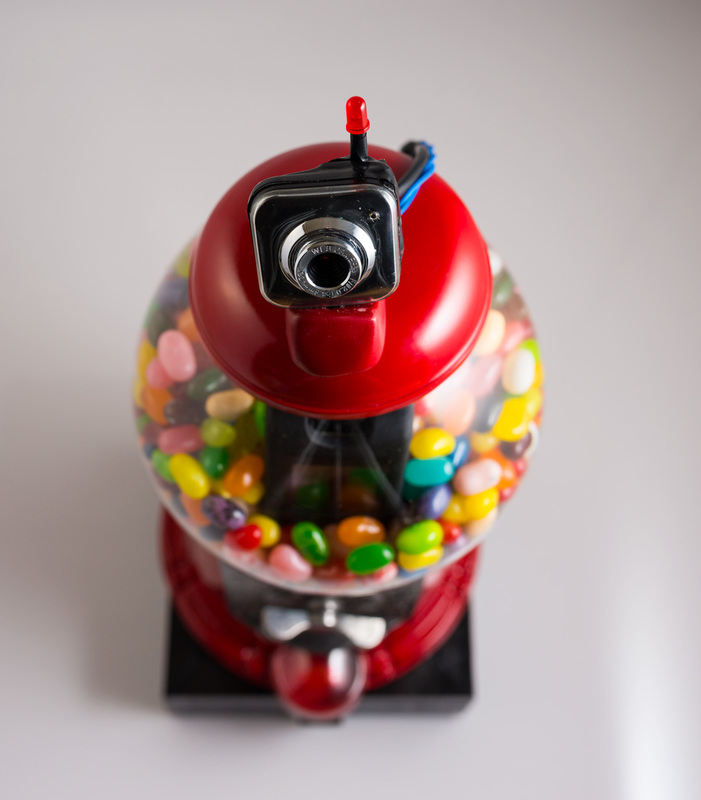 The machine’s normal function – dispensing candy through the turn of a crank- has been augmented so that it captures images when used and displays them. The machine operates by turning a bin that moves candy. A switch detects when the bin moves, sending a signal to the GPIO pins of a Raspberry Pi board located in the black box beneath the machine. When the circuit is closed, shell code on the Raspberry Pi causes the web camera to momentarily turn on, capturing a single frame of video that is saved to its hard drive. These images are called by another piece of shell/C code that pushes them to the LCD screen. The screen was a repurposed LCD slideshow keychain whose firmware I had altered. Ultimately, I produced six Candy Camera units, one for each household in our deployment study.